There are many beautiful gardens in the Dordogne area. Some of my favourites are listed below. Marqueyssac is the most famous. This is a fabulous garden to visit and one of the few in the area worth visiting with children. It is almost exclusively made up of clipped box but near the chateâu this is clipped into elaborate swirling designs and includes paths of clipped rosemary and santolina. There is then a much wilder walk in woodland and clipped box which meanders 130 metres above the river giving fabulous views. The visit is made unaccompanied by a guide (which is obligatory at other gardens such as Les Jardins de l'Imaginaire and for me reduces the pleasure) . There is an area with swings and a picnic area and during the summer on certain days children older than 6 can learn rock climbing . During the summer each Thursday evening the gardens are lit by candlelight and various musicians play in different parts of the garden. A magical experience not to be missed. The Gardens at Marqueyssac are one of the few Dordogne attractions to remain open all year round. 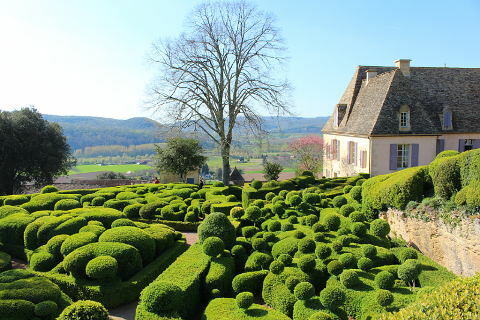 The Jardins de Marqueyssac are situated 9 km south-west of Sarlat near Vézac. These very formal gardens are made up of clipped hornbeams and box together with pines and cypresses. Very few flowers are allowed to compete with the formal layout and intricate shapes. The overall effect is beautiful but lacking in the seasonal variations and colour that most gardeners enjoy. Excellent to visit any time of the year but a great contrast mid summer or mid winter when the surrounding countryside is parched or bare providing a huge contrast to the shimmering green of these gardens. The Jardins d'Eyrignac are situated 13km north-east of Sarlat near Salignac. These are lovely gardens in a very attractive setting - surrounded by tree-covered hills. There are four main areas to the garden. The first is by the swimming pool and is a mass of colour all year round. Further on there is a large lawn with a long flower border on one side and a wonderful potager (vegetable garden) on the other. This is a mixture of unusual vegetables and flowers and surrounded by woven willow. A shadier section of the garden has various shrubs plus an area of topiary on the edge of the hillside. Finally you can take a wilder walk up the hill to get some great views of the surrounding countryside. The Jardins de l'Alberede are on the edge of Domme. The gardens at the Clos des Sources are in a beautiful woodland setting and spread out along the edge of a hillside. With grasses border and an alley with different foliage plants and nearer to the house lovely flowering borders also offering great views over the surrounding countryside. There is also a pepiniere and a salon de thé. The Clos des Sources garden is situated at Vitrac near La Roque Gageac. The Jardins Panoramique de Limeuil is a park with gardens and all set with a wonderful viewpoint over the beautiful village of Limeuil and the confluence of the rivers Dordogne and Vezere. The gardens also have an educational element and various workshops are available to children in the summer. The Jardins Panoramique de Limeuil are situated at Limeuil to the east of Sarlat. This amazing garden is almost entirely made up of bamboos and grasses and displays the enormous range and versatility of both. Some of the bamboos are massive - both in height and diameter. 250 species of bamboo and 430 species of grasses are grown here. This is a good garden for a hot day as the bamboos provide lots of shade. And even better for plant lovers there is a nursery on site where you can buy plants to take home! A collection of large ponds planted with water lilies and Lotuses. The garden has a backdrop of cliffs and woods and when in flower the oriental scent of the lotus flowers is sublime. Lotus flowers can be seen from June to October and can be 2m tall. As well as hardy water lilies in the ponds there is a large collection of more exotic water-lilies which need protection over winter. The Jardins d'Eau de Carsac are situated at Saint Rome, Carsac near Sarlat. La Roque Gageac is one of the most beautiful villages in the Dordogne (though it can get very busy in the summer). One of its residents Gérard Dorin, vice president of the association "Fous de Palmiers" (lovers of palms) has turned this beautiful village into an equally beautiful garden. He has planted bananas, bamboos, bougainvillias and masses more giving a jungle effect to the village built up the rocky slope next to the Dordogne river. See La Roque Gageac for more information. I have sneaked this into 'gardens' without my wife, the garden expert, knowing. Near St Leon sur Vézère, there is a lovely walk through the woods to a fine viewpoint. Since you will pass botanical signs en route I think it's fair to include it here. These award winning gardens have been planted on a steep hill next to the attractive town of Terrason. The gardens are fairly modern and use a lot of willows, water and nepeta. The nepeta creates a link with the blue slate rooves of the town when it is in flower and the result is very striking. The use of water in the garden is particularly well done with rills and water jets. A very stylish garden and well worth a visit but slightly spoiled for me by the compulsory tour. The Jardins de l'Imaginaire are located at Terrasson. There are two gardens very close to each other. One, les Jardins Tranquille, is a park of 4 hectares on the edge of the river Dronne. Some very nice planting, with wide English style borders running along the edge of the river. Well worth a visit. The other is a botanic garden, is free and is a perfect dream for anyone with an interest in vegetable gardening. The Jardins Tranquille are situated at Brantome. Not your regular garden but La Brande is great for kids as there is an amazing collection of cabanes (tree houses and huts) built of willow and various other materials hidden throughout a woodland walk. Very inspiring if you are thinking of trying a bit of willow-weaving at home or want to build a play house in the garden which is fun but looks attractive too. A very nice garden centre is attached with an excellent selection of plants. The La Brande gardens are situated at La Brande, towards Perigueux. One of my favourites. Les Jardins de Sardy is built around a lovely old French farmhouse. One of its key features is a beautiful pond set below the farmhouse and surrounded by abundant planting. The pond is one of the best I've visited in any garden. It is a long rectangular pond with water jets from each side forming arches of water over the pond. The view along the pond leads the eye to the tall cypresses and the old farmhouse at the end - wonderful. The Jardins du Sardy are situated at Velines near to Castillon. Gardens information supplied by French gardens.